Live entertainment is a huge part of any event, so it is important that it is effectively sourced. At Matchbox Music we offer a diverse but concise selection of bands for hire, and aim to unite our clients with entertainment that is perfectly matched to their event. We maintain a consistently high standard by carefully selecting our artists, and building a close working relationship with each one of them. Nick began working in the industry after his time at the London College of Music. Alongside a successful music career as a performer and musical director, for some time Nick has been responsible for the entertainment at some of the most exclusive hotels and has experience in managing corporate entertainment. As a session guitarist working with some of the worlds biggest acts, Dan has an in-depth knowledge of what it takes to make a great performance. His extensive work on TV shows and world tours has allowed him to gain a wealth of experience that he brings to the forefront of Matchbox Music. "They dealt directly with our venue professionally and efficiently, leaving us in no doubt that that they had everything organised for the day"
At Matchbox Music we understand how important it is for a company to host great events for their employees, or to impress clients. We are innovative in our approach to these events, and offer exclusive entertainment that will guarantee a night that will continue to be talked about for some time. For information on our past events, please visit our Blog page. For every special occasion we believe that there should be a special celebration, and what better way to celebrate than with one of our fantastic party bands for hire. We also offer a number of acoustic acts of all genres that specialise in wedding reception music, if you require something a little more understated. All of these can be found on our Artists page. For our clients who require resident artists for longer contracts, whether it be a party band on a cruise ship or jazz band in a hotel, we have a large selection of acts who have extensive repertoires to ensure that no two nights are the same. 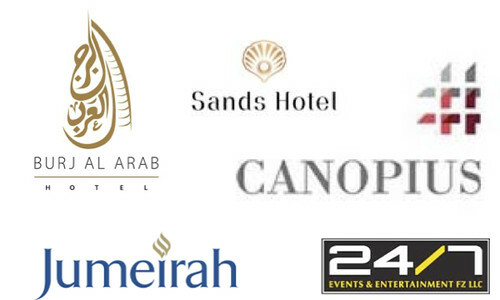 Some of our previous contracts include The Burj al Arab (Dubai), The Sands Hotel (Abu Dhabi) and DFDS (Ship) - to name a few.